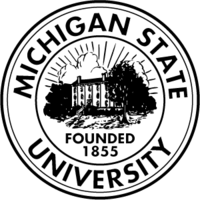 Michigan State University (MSU) is a public research university in East Lansing, Michigan USA. Founded in 1855, it was the pioneer land-grant institution and served as a model for future land-grant colleges in the United States under the 1862 Morrill Act. Its alumni include at least five winners of the Pulitzer Prize. MSU’s record of Rhodes scholars has led the Big Ten since the 1970s. MSU pioneered the studies of packaging, hospitality business, telecommunication, and music therapy. Today its study-abroad program is the largest of any single-campus university in the country, offering more than 200 programs in more than 60 countries on all continents including Antarctica. It is considered to be one of America's Public Ivy universities, which recognizes top public research universities in the United States. Following the introduction of the Morrill Act, the college became coeducational and expanded its curriculum beyond agriculture. After World War II, the number of students tripled as the institution became a major university. Today, MSU is the eighth-largest university in the United States, with 46,045 students and 2,954 faculty members. 1862 To grant lands to each loyal state to support a college "where the leading object shall be, without excluding other scientific and classical studies and including military tactics, to teach such branches of learning as are related to agriculture and the mechanic arts..in order to promote the liberal and practical education of the industrial classes in the several pursuits and professions of life." MSU's Division I sports teams are called the Spartans. They compete in the Big Ten Conference in all sports except ice hockey, in which the team is part of the Central Collegiate Hockey Association. MSU's football team won the Rose Bowl in 1954, 1956, and 1988 and boasts six national championships. Its men's basketball team won the NCAA National Championship in 1979 and 2000. The MSU men's ice hockey has won national titles in 1966, 1986, and 2007.